In the post preceding this one, Terri asked what I was going to quilt in the alternate blocks. Now that I have a row of them done, I will show you. The stencil design is by Anita Shackelford, and it looks so beautiful stitched out. I have wanted to do this one for awhile, but honestly, I wasn’t sure I could pull it off. It’s actually quite fun to do. 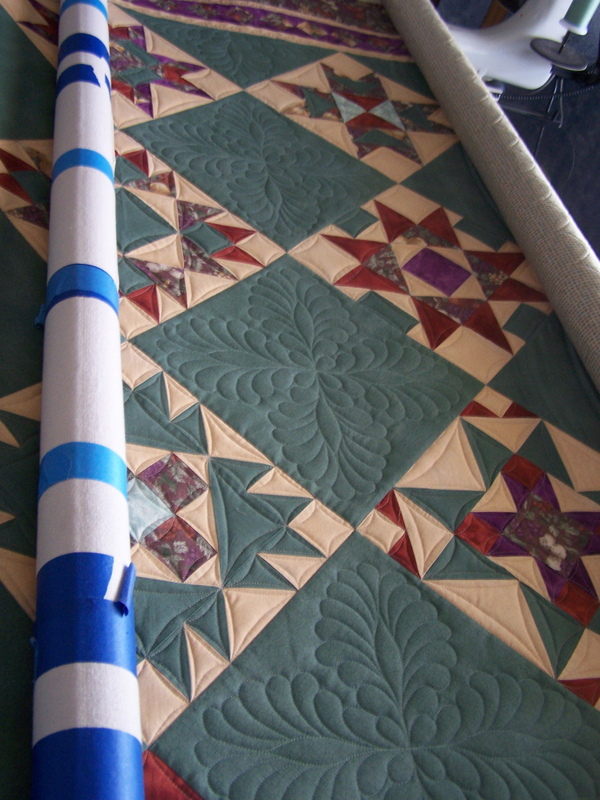 Carla Barrett inspired me to purchase it after she posted a couple of quilts that she used it in, on her blog. One was this beautiful log cabin. 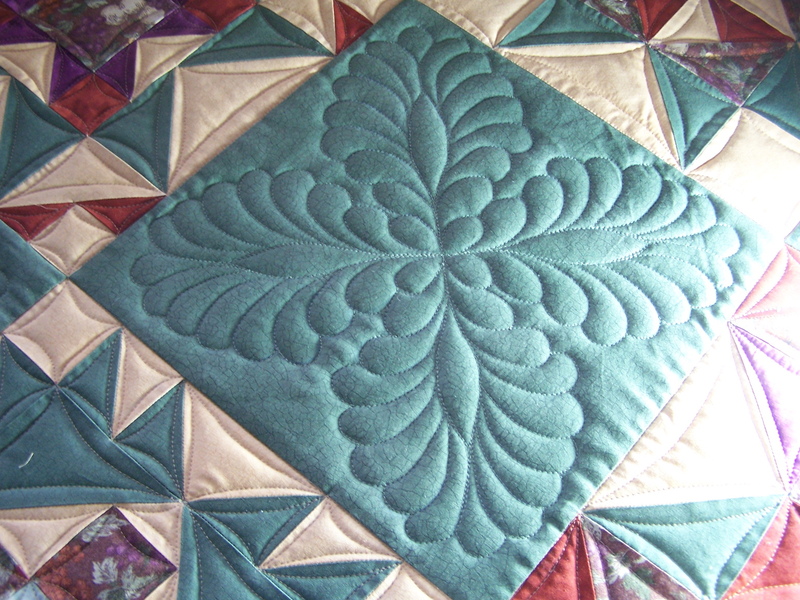 The other was a stunning Carolina Lilly quilt, which you can find if you click her gallery tab. That is gorgeous Randi. Awesome job. That makes the quilt!! I had wondered the same thing. Fabulous, Randi! Now I NEED that stencil, dammit! One more question for you…How did you mark? that is a very pretty stencil, randi, and it looks like you pulled it off quite nicely! beautiful Randi! I’d say you pulled it off smashingly! That sure is beautiful!! Love that pattern from Anita!! You are so very talented! These designs are just exquisite and so well-done! It’s beautiful Randi!!! I was really liking this quilt before but now it’s absolutely stunning!!! Wow, Randi, your quilting is really stunning. Merry Christmas to you and you family. I hope you have a great day. Randi – you have made a pretty quilt an absolute sparkling gem! I know that you like to give some credit to Corky but in the end the most credit must go to Randi! 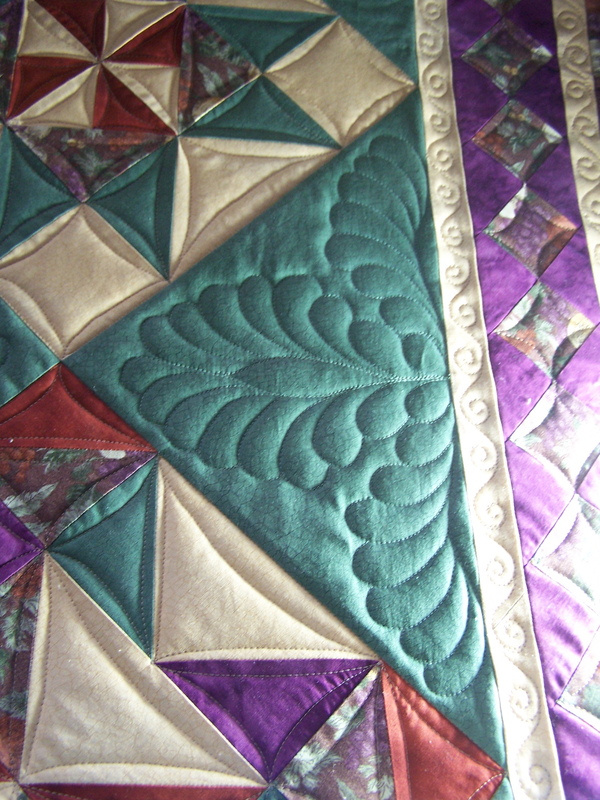 Your beautiful work and your willingness to share with us make you an asset to the quilting community. Randi, the quilting is ABSOLUTELY lovely! You ought to be SO proud of yourself as you did an incredible job! « Why Am I Up So Early?